I'm here enjoying the last days of summer and trying to make the most of my summer clothes, hence, the shorts and sandals. The idea that summer is almost over is absolutely horrifying but what's a girl to do except embrace the different seasons of life? I went to H&M in Manhattan (the one close to Madison Square Garden) and I was impressed by their wide selection of work attire. I don't usually find anything that interests me at H&M at Green Acres Mall in Long Island. 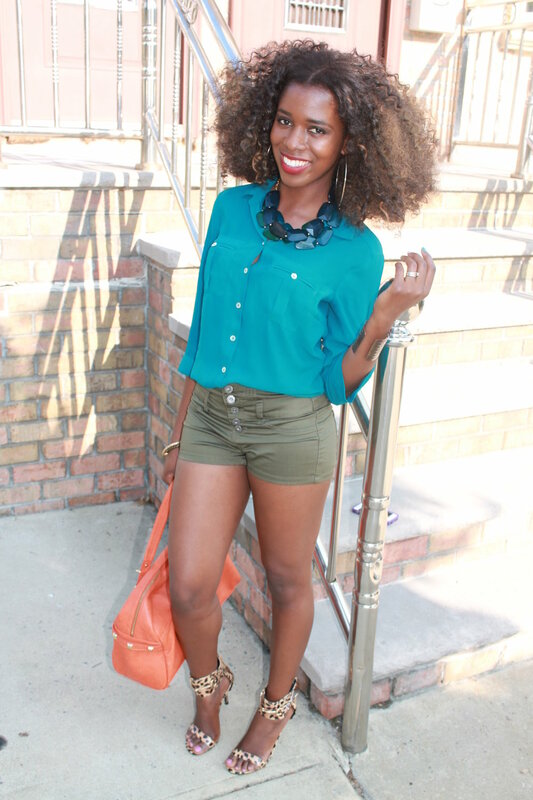 I purchased this teal blouse from them a while back, matching it up with the army green shorts from Mandees, snake print sandals from Charlotte Russe and orange purse from Strawberry. I love how all these colors complement each other without creating a look that is neither too bright/harsh nor too dull.